Old Mdonya: 12 tents, scattered in a spacious area under the shade of large sycamore fig, nestled in the curving banks of a sand-river. 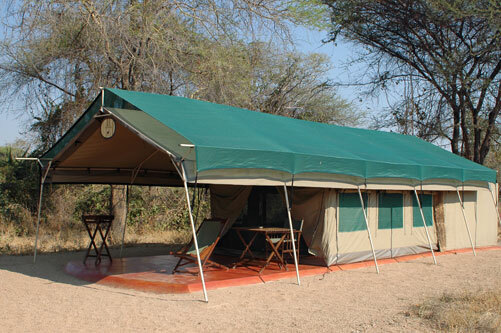 They are traditional safari tents. The tents are simply but comfortably furnished. There is no electricity (except in the office, where camera and other batteries can be charged up overnight). 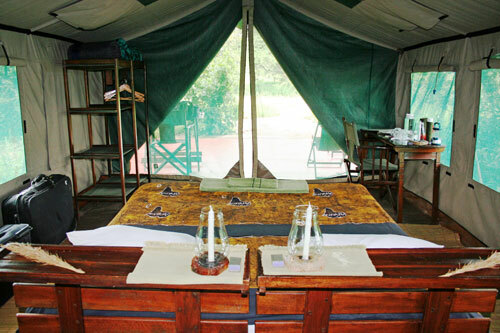 All the tents have en-suite bathrooms with dressing room, open-roofed shower and separate flush toilet. Solar power warms up the water and produces electricity for use in the Camp Office. Therefore torches, provided in tents, work with rechargeable batteries and kerosene lanterns light up tent bathrooms.